Long relegated to the back of the pack, the Titan has new duds that finally give it a fighting chance. A 5.6-liter V-8 makes 394 lb-ft of torque and mates to a seven-speed automatic and rear- or four-wheel drive. Supportive seats and a quiet cabin make the Titan practical and comfortable for cruising the highway as well as the job site, and it can tow up to 9390 pounds. The crew cab with a 5.5-foot bed is available now; single- and king-cab models, plus 6.5- and 8.0-foot beds, arrive in 2017. A contagion infects all of America’s latest full-size pickup trucks. What were once boring machines built for utility are now the most overstyled, oversize, and overwrought of vehicles. 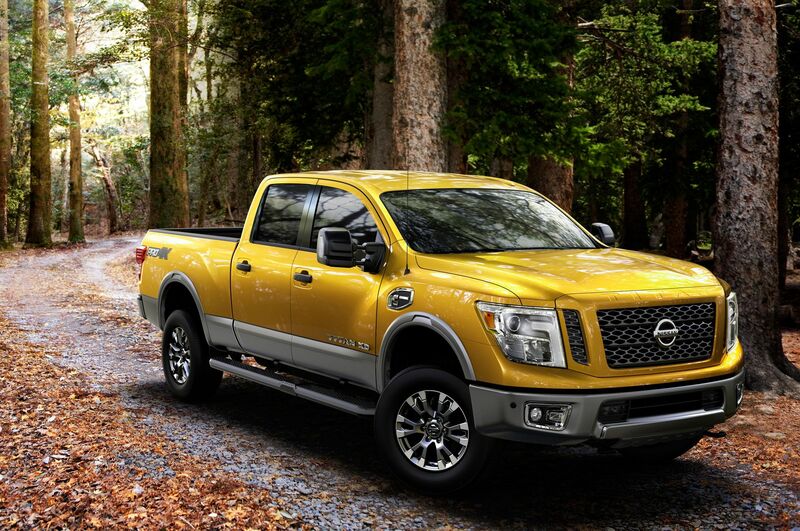 Look at the 2017 Nissan Titan. An entire steer could be barbecued on its grille, were that component not made out of easy-melt shiny plastic. The fenders are as tall and square-shouldered as a Cleveland Browns lineman. If any button were bigger on the instrument panel, it could be engaged with a sledgehammer. The heavy steering feels as if you’re pulling against a black hole’s gravity. Aliens couldn’t undermine humanity’s faith in our own self-restraint any more convincingly. Someday, all this will be regarded as an era of unbridled excess every bit as flamboyant as the big fins and shiny chrome of the 1950s—and probably with as much nostalgia. The SL tested here is the mainstream Titan. Assembled in Mississippi, it’s a half-ton crew cab with rear-wheel drive and leather upholstery that’s well equipped—although not ridiculously lavish in the manner of the line-topping Platinum Reserve. In 2004, the first-generation Titan was regarded as a landmark challenge to the one market segment Detroit automakers still dominate. Now? It’s just another player, and a small, bit player at that. This new Titan carries over several features from the first-generation model. It still rides on the same 139.8-inch wheelbase, employs the same basic steering elements and general suspension design (unequal-length control arms up front, leaf springs positioning a live axle in the back, as is the norm for pickups), and casts a similarly shaped shadow. But this Titan isn’t strictly a rerun, either. It’s 3.5 inches longer than the previous-gen crew cab with a similar 5.5-foot bed, because bigger seems to be the only direction allowed when it comes to marketing full-size pickups. Its rack-and-pinion steering gear remains hydraulically assisted, but it’s been quickened from 19.5:1 to 16.0:1 (and that knocks down the number of turns from lock-to-lock from 3.6 to 3.0). The former five-speed automatic transmission has been swapped out for a new seven-speed unit, and the 5.6-liter V-8 has been significantly revised to add power and improve fuel economy.